When it comes to weeknight meals, I try to keep things super simple! Even if we don’t have a ton of activities going on in the evenings (although, many days we DO), it’s nice to be able to enjoy our time together around the table with a homecooked meal. I try to create a balanced plate that very often includes a lean protein, veggies and whole grains. 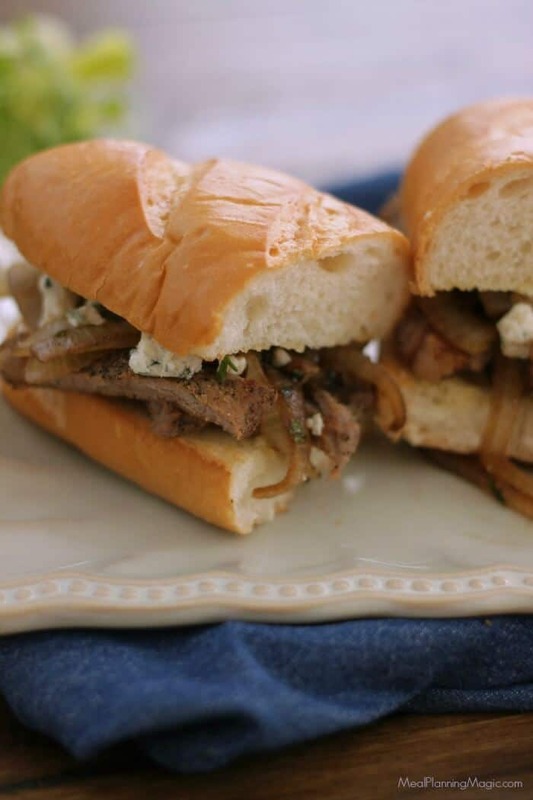 That’s why I’m excited to share this recipe for Bistro Style Steak and Onion Sandwich with you all. Inspired by a Pampered Chef recipe I came across, I’ve tweaked this recipe to make it a little healthier than the original and it’s still super simple! It starts with a delicious lean cut of New York strip steak that is pan seared. Sliced onions with balsamic and blue cheese add a depth of flavor that make this meal a tasty weeknight meal that you’ll be surprised you can create so quickly. Pair it with a garden salad or deli style potato chips and you’ve got a meal that will make you feel like you’ve gone out to eat but for far less money. 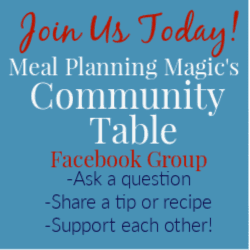 This week I’m partnering again with The Beef Checkoff and Sunday Supper Movement and other bloggers to share my recipe with you all! Not only will you find inspiration by visiting their blogs using the links below, I encourage you to check out The Beef Checkoff’s website for a TON of great recipes featuring lean beef and other healthy ingredients. There are so many I want to try including this Mediterranean Beef Kofta (we enjoy this type of thing frequently so I can’t wait to try this recipe!) or these Mu Shu Steak and Apple Wraps. They can both be made in under 30 minutes so would be perfect for a weeknight meal. Plus I love the international flare with each of these recipes! 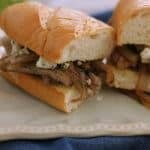 Skip the restaurant with a Bistro Style Steak and Onion Sandwich made at home in under 30 minutes! Balsamic vinegar and blue cheese make flavors pop! Heat large skillet over medium-high heat, about 5 minutes. Season steaks with black pepper and garlic. Cook steaks 5-10 minutes on one side or until browned. Turn steaks over and cook an additional 5-10 minutes or until temperature registers 140° for medium-rare doneness. Remove steak from pan to a plate and cover lightly with foil and set aside. Slice buns and spread the 2-3 tablespoons of butter evenly on each side of each bun. Sprinkle evenly with garlic powder. Place buns, open with butter mixture facing up, on a baking sheet and broil under low broil setting for 2 minutes or until lightly golden brown (be sure to watch it so it doesn’t burn!) Remove sheet from oven and set aside. In same large skillet you used to cook the steak with drippings remaining, melt remaining tablespoon of butter. Add sliced onions and cook until softened, translucent and slightly browned, about 5-7 minutes. Add parsley and vinegar to pan and cook 3-4 minutes or until onions are caramelized. Slice steak into 1/4-inch pieces. Place steak and onion mixture evenly over one half of each toasted garlic bread buns. Sprinkle with blue cheese and top with remaining garlic bread bun half. Serve with chips or garden salad. For more healthy beef meal ideas, be sure to check out The Beef Checkoff website or follow their Healthy Meals With Beef Pinterest boards or find them on Facebook and Twitter for even more recipe inspiration. Disclaimer: This post is sponsored by The Beef Checkoff in conjunction with a social media campaign through Sunday Supper LLC. All opinions are my own. I’d have this sandwich for lunch and dinner too. Yum! This sandwich looks and sounds amazing. I’m all for beef and blue cheese. I think it’s a perfect pairing. Filing this one for a weekday supper in our home soon! 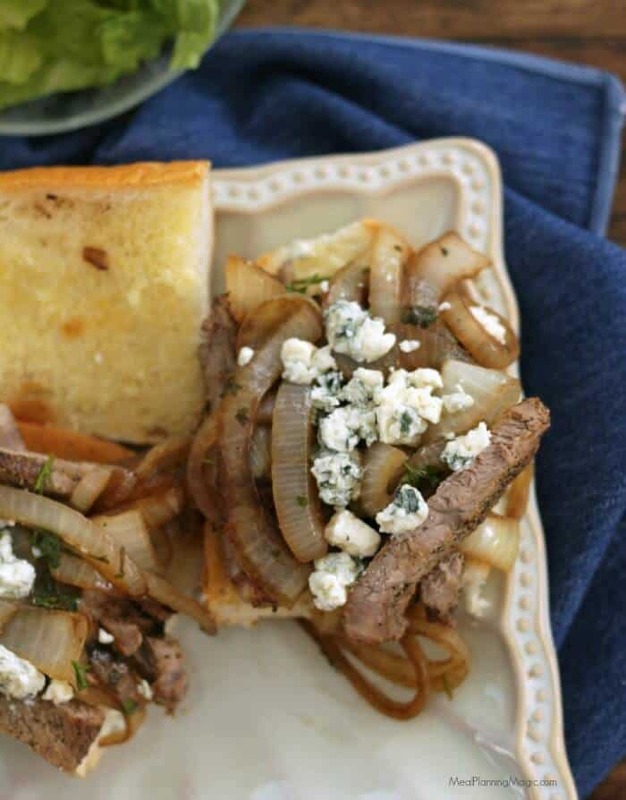 Any time you say steak, blue cheese, and onions, you can count me in!! Beautiful sandwich!